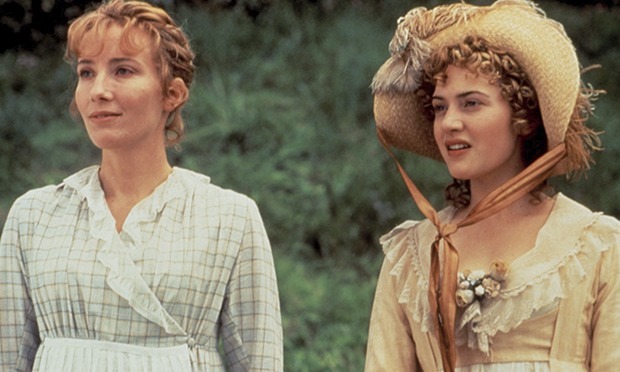 Sense and Sensibility is a film I discovered years later during an obsessive teenage phase of romantic period dramas. I went through them all and only had two films that I enjoyed re-watching over and over again. One of them is 2005’s Pride and Prejudice and the other is Sense and Sensibility. Emma Thompson wrote and starred in the big screen adaptation of Jane Austen’s arguably second most famous novel. Thompson plays Elinor Dashwood, the oldest sister of the Dashwoods and the most sensible – a total opposite of Marianne (Kate Winslet), the most romantic of the three. When their father dies, their home is inherited by their eldest half-brother, whose wife convinces him to show little charity to his stepmom and sisters. Already grieving over their late father, the two elder Dashwood women must adjust to a new life, while dealing with romantic encounters that could shape the rest of their lives. Thompson and Winslet may play complete opposites, but both share a tangible sisterly camaraderie that makes us care deeply for them and their family. The actresses are both mega-talents and bring much to their roles, but the camerawork in the film intensifies them and their extreme differences and similarities when it comes to matters of the heart. One of my favorite scenes is when all of the women in the house run to their rooms in tears and Elinor is left outside, sitting on the stairs sipping on tea with poise. Sense and Sensibility takes its time, moving through each new development at a languid pace. It’s the kind of thing that makes you pause quite often wondering at what point in the story you are at: beginning, middle or end. It doesn’t exactly make the film feel like an endurance test because the lively, passionate characters and stunning visuals are worth spending more time with. The romances at play are the film’s chief joys. We have Hugh Grant as Edward Ferrers, who is drawn in by Elinor pragmaticism and beauty. Grant plays Ferrers humbly, which suits Thompson’s performance just right. Then we have John Willoughby (Greg Wise), whose passion and exuberance matches that of Marianne’s. The two fall in love instantly, and it ends as quickly as it begins, but the feelings that were shared still remain even though Marianne learns to move on with the kind and loyal Colonel Brandon (Alan Rickman). Rickman is absolutely perfect in this role, and for he not only shares a sweet chemistry with Winslet, but a quiet connection with friend and frequent collaborator Thompson. Rickman’s interactions with both Dashwood sisters make him the true romantic hero of the story and the one that surprises us the most. Jane Austen’s stories will continue to be re-adapted for film time and time again. The stories are timeless since they never fail to impact each new generation in some way. However, I can’t imagine another adaptation capturing the essence and atmosphere of Sense and Sensibility as well as Ang Lee’s film. It’s like the novel came to life on screen. Previous ArticleFirst Trailer for "Independence Day: Resurgence"